Well a couple of days ago it was about 60 degrees here. It was bazaar. And two days later it snowed. It has been so cold, and for a long period of time. Usually it doesn't get THAT cold here. But it has been THAT cold. Not. Okay. So when we had this one day of amazing and perfect weather we did a lot of things to soak that in. We opened our windows to let the breeze in and we sat on the porch and then we made a cocktail. 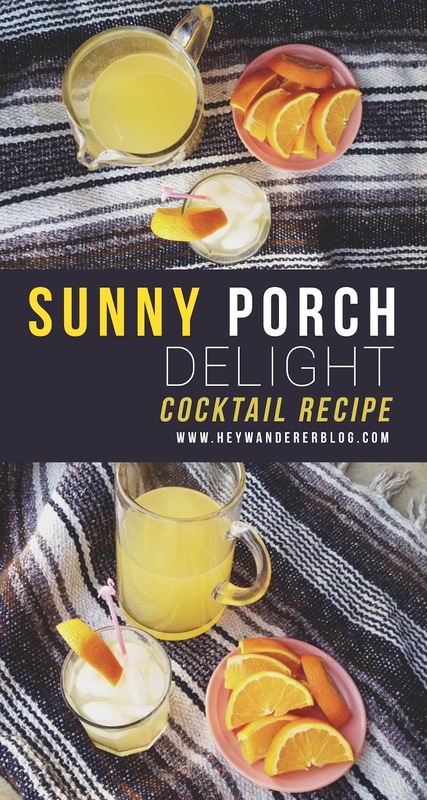 This particular cocktail was a sunny summery kind of drink because we all have a mild case of winter-time blues. It was just what we needed in this long winter. **To make the simple syrup, mix together 1 part water and 1 part sugar over medium heat. When the sugar completely dissolves, remove from heat and you have simple syrup. To make the lemon chamomile syrup you would add chamomile and lemon zest into the mixture and let it sit for at least 15 minutes. Strain the simple syrup and serve or store! If you liked this recipe, please pin the image below or share on your facebook!